Lupita Nyong’o once said: “No matter where you’re from, your dreams are valid. ” Your Dream is a pathway to your destiny. Your life all begins with a dream in your inner world. It all starts with the picture of a better life. Your future or destiny is not in the stars or in any ones hands, but it is in your dream. 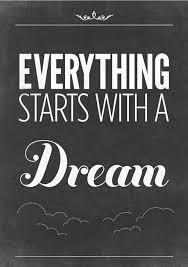 A dream is not just the pictures and sounds that flow through your mind in a dream state while you sleep. It’s what you picture yourself becoming, owning, doing, achieving and possessing. A dream is a very clear presentation of the future in your mind. Greatness begins with a dream. Where you are now is the result of the dream you had in your heart. Your dream is the prophecy of the greatness that God has prepared for you. If you can see it, you are half way there. If you can see a clear destination ahead of you, certain powers will awaken within you to propel you towards that picture. Ask any successful person how they got to where they are? They will tell you that they had a big dream which they pursued and it got them to where they are today. Success doesn’t just happen, it begins as a dream in your inner world. Without that dream seed in your inner world, success will never blossom. The dream in your inner world is the guiding light that leads you into your destiny. Many people have no idea what they ought to do with their lives. They are confused. They try their hands on so many things and end up frustrated. I am a living witness to this. I met several set back in my life and today it is a history. Many struggle through a greater portion of their lives simply because they have not connected with their dreams. Dear friend, the starting point is to document your dream according to prophet Habakkuk in the Holy book who said: Write down your vision and make it plain upon table that he may run who reads it. Documentation of your dream is a powerful key to pursuing and attaining your God giving purpose. Write down your dream in a place where you can see it, read it and meditate on it. This entry was posted in success and tagged Consistent, Fulfillment, Habit, Insight, Journey, Life, Life Changing, Passion, Persistence, Principles, Spiritual, success, Successful, Talent, Wisdom. Reblogged this on ROCA NEWS NAIJA. Thanks Fabian, for your comment.